Alexi Lalas, born Panayotis Alexander Lalas in Birmingham, Michigan, USA on 1 June 1970, is a former American soccer player and a current soccer commentator of Greek and American descent. Lalas played mostly as a defender for the US men’s national soccer team as well as a number of clubs, including Padova, New England Revolution, MetroStars, Kansas City Wizards and Los Angeles Galaxy. 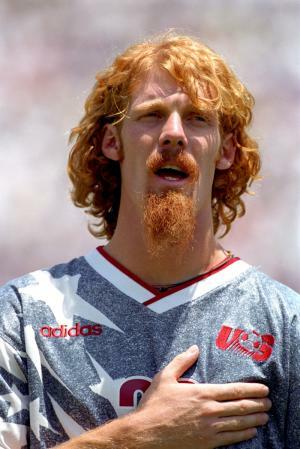 During his career, Lalas was best known for taking part in the 1994 FIFA World Cup, where he caught the attention of the public for his recognizable long beard and hair. Alexi Lalas is also known as the first American to ever play in the highest-ranking soccer league of Italy, the Serie A. So how rich is Alexi Lalas? Sources estimate that Lalas’ net worth is $1.5 million, with the most part of his wealth having come from his successful soccer career, which spanned for over 15 years. Lalas was born to a Greek father, Demetrius Lalas, who was a professor, and an American mother, Anne Harding Woodworth, a writer and a poet. Lalas attended Cranbrook Kingswood School in Bloomfield Hills, Michigan, where he was named the 1987 Michigan High School Player of the Year in his senior year. He later attended Rutgers University from 1988 to 1991, which he left in 1991 to fully focus on his soccer carreer. Alexi Lalas did, however, resume his education in 2013, earning a bachelor’s degree in English with a minor in music in 2014. After the 1994 FIFA World Cup, Lalas joined the Italian club Padova Calcio, where he helped the team avoid relegation from the Serie A in the 1994/1995 season. He returned to the US the following season, joining New England Revolution, where he played until the club traded him to the New York Metrostars in 1997. Lalas spent a season with them before moving to the Kansas City Wizards in 1999. He played there for a year before announcing retirement on 10 October 1999. His most successful spell was with the Los Angeles Galaxy, with whom he signed in early 2001, coming from retirement. During three seasons with the Galaxy, Alexi Lalas won the CONCACAF Champions’ Cup in 2000, US Open Cup in 2001, MLS Cup and MLS Supporters’ Shield in 2002. On 12 January 2004, he announced his permanent retirement. Later same year, he was appointed as the general manager of the MLS club San Jose Earthquakes; he served the same roll for the New York MetroStars in 2005 and Los Angeles Galaxy in 2008. He was elected to the National Soccer Hall of Fame in 2006, and he joined FOX Sports in 2015 as a studio and game analyst. In addition to his rich club career, Lalas also represented the US men’s national soccer team on 96 occasions between 1991 and 1998, competing at the Olympic Games in 1992 and 1996, as well as the FIFA World Cup in 1994 and 1998, scoring nine goals overall. Alexi Lalas is a big rock music fan. He played in the banned called “The Gypsies” since his college days, and they released an album called “Woodland” in 1994. Lalas has also produced three solo albums: “Ginger” (1998), “Far from Close” (2008) and “Infinity Spaces” (2014). 1 Soccer analyst with ESPN, January 2009-present. 2 Inducted into the National Soccer Hall of Fame in 2006. 3 General manager of Metrostars (MLS) (2005). 5 Played for the Los Angeles Galaxy football club (2001-2003). 6 Played for the New York/New Jersey Metrostars football club (1998). 7 Played for the New England Revolution football club (1996-1997). 8 Played for the Kansas City Wizards football club (1999). 9 Member of the US World Cup team (1994 and 1998). 10 Member of the 1996 US Olympic soccer team. 12 First American to play in Italy's Serie A soccer league for Padova (1994-1996). The Big Green 1995 performer: "KICKIN' BALLS" / writer: "KICKIN' BALLS"